Celebrating the simple beautiful things in life! Happy Birthday to my Mom!!! Today is my mom Debra’s 54th birthday…I know, she looks great for her age and she is a pretty remarkable woman. She was born and raised in the Bronx and is 100% Puerto Rican (Making me and my sisters 1/2 PR and 1/2 Greek) and is a little spit fire. Strong emphasis on the little she is only 4′ 11″ ( I’m 5′ 3″ thanks mom, haha). She came from a life of poverty and physical abuse thanks to a horrible stepfather and she was able to overcome it all. She was one of the few of her six siblings to attend and graduate college and become a business manager. She managed a very successful bakery in Brooklyn where I pretty much grew up. I have very fond memories of those years in the bakery. My mother is currently a first degree black belt in the Korean Martial Art of Tang Soo Do. She now is also an instructor at the martial arts school she earned her belts in. This year she even attended the World Tournament of the Tang Soo Do Association in North Carolina and walked away with a bronze medal in weapons. She is truly an inspiration to me and keeps me looking forward to all that I can accomplish in the coming years. I LOVE YOU MOM AND HAPPY BIRTHDAY!!!! Watson Jay Clairemont the 3rd Esquire: Update! Now who is this stranger with the fancy name? A Duke? A country gent? Nope, Watson Jay is a…possum!!! Haha yes it’s true, and no I am not ill. Around here in NEPA we have a lot of wildlife and sometimes we have regular visitors to our home. We have a female deer who returns to our woods every year to have her babies called Mama. We have the little rabbit that you already have been introduced to called Little Rock. Then there is Snefru the chipmunk, named after a pompous and bratty ancient Egyptian royal. Snefru is not afraid of anything even though he can potentially be dinner to pretty much every animal around here. And finally there is Watson the possum. Watson has been making regular appearances lately one of them being during the day yesterday. I found it odd seeing a nocturnal creature out in the day feverishly looking for food. Then it dawned on me, what if Watson is a Wilhelmina? 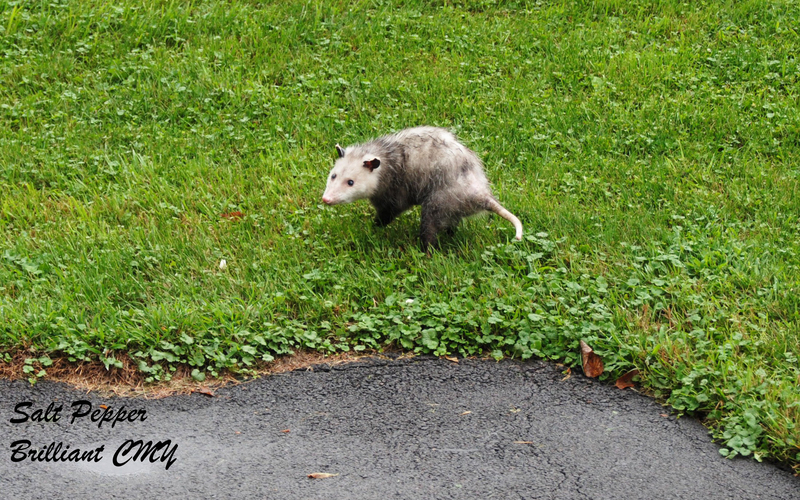 The only time I have heard of possums being out in the day is when the mothers are looking for extra food for growing babies. She also had a funny gate which could indicate she had babies in her pouch. Well if this is true congrats to Watson (We will still call the possum Watson even if it is a girl, haha). We are quite familiar with animal babies around here. We have hade fawns, tons of bunnies, and even baby skunks. We don’t have a picture of Watson yet but once we do I will definitely post it. Have a great day everyone, new beauty post coming soon!!! Christina has read 4 books toward her goal of 20 books.